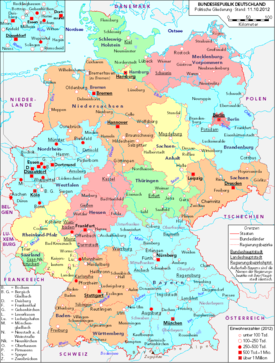 The Federal Republic of Germany (FRG) has 16 states (German: Bundesländer, singular: Bundesland). The biggest is Bavaria and the smallest is Bremen. Most of them were created after the Second World War, although their historical roots can be traced back to the early Middle Ages in some cases. 1952: Three small states (Baden, Württemberg-Baden and Württemberg-Hohenzollern, part of Germany since 1949) joined together to form Baden-Württemberg. 1957: The Saar, which was put under French administration after World War II, joined the Federal Republic of Germany as the Saarland. 1990: On German reunification, the reunited city of Berlin and the territory of the former German Democratic Republic joined the Federal Republic as six new states. Population and area in km² as of November 2014. This page was last changed on 16 November 2018, at 15:55.